Custom stamps and embossers are the next big thing in stationery. In our increasingly digital world, paper just gets more and more indulgent. 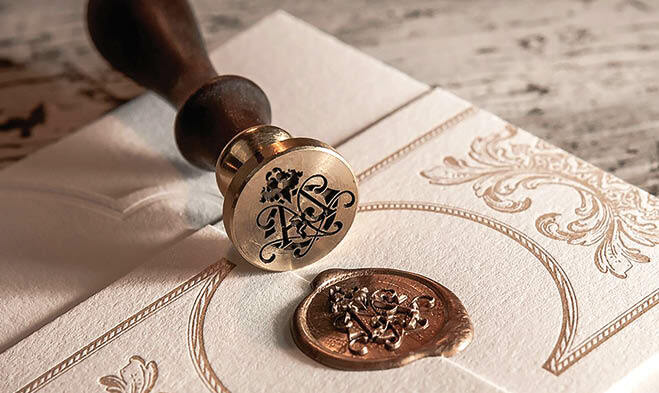 To take their wedding and newlywed stationery to the next level, many couples are using handsomely designed custom stamps and embossers with their names, logos or monograms. Stanaitis recommends StazOn, a solvent-based ink that dries quickly and doesn’t smudge. She says brides are using the stamps on everything from favors to thank-you cards to envelopes. Kate Panke, owner of custom invitation studio Paper Rock Scissor in Minneapolis, uses embossing on wedding invitations and also makes smaller personalized embossers for return addresses. “It’s such a beautiful and subtle way to add visual interest and texture,” she says. For the invitations, Panke uses embossing less for text and more for floral and geometric patterns. Adventurous couples, she says, are even using all-over debossing with the invitation text pressed on top. Talk about making your mark! These invitation suites walk on the dark side with moody hues and elegant florals.